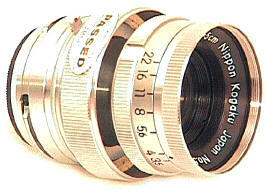 The 1956 Micro Nikkor was Nikon's first ever Micro lens, starting a long Nikon tradition of high resolution close up lenses which continues to this day. 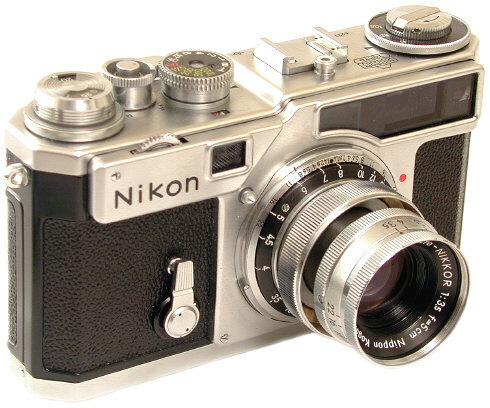 It is one of the rarest and most unique Nikon Rangefinder lenses. Modern Photography reported Nikon describing the 5 element lens as an Apochromatic -- focusing all three primary colors to the same point. Resolving ability was reported to be extremely high, beyond the ability of most films at the time to record it. The Micro Nikkor in extended and collapsed position. The extended position coupled to the rangefinder from infinity to three feet. The collapsed position offers more compactness when mounted on a body but offers no practical use -- since there is no way to focus it. Instead, the collapsed position is intended for use on the rare Nikon Rangefinder copy stands. Not particularly convenient, but it was possible. In collapsed position, however, the aperture ring was inaccessible. 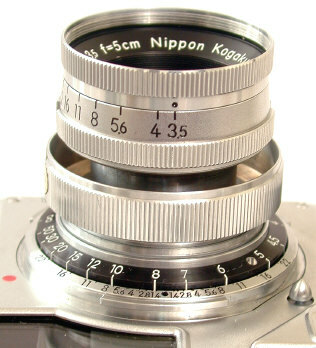 Nikon made a "diaphragm collar" which attached to the aperture ring, making the lens usable on the copy stand. It looks much like a very large lens shade, and today is very hard to find. 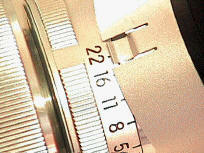 Like most Nikon rangefinder lenses, turn the body helical to infinity before mounting or dismounting lenses. An apparently unused lens with its JII sticker, Nippon Kogaku Nikkor plastic bubble and Nikkor lens cap. 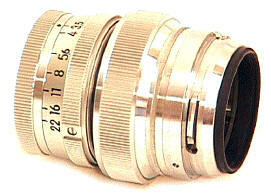 On this particular example Nikon used a 39mm lens bubble, presumably from the El Nikkor 50mm enlarging lens with a plastic Nikon S mount to Leica 39mm adapter, to fit the Micro Nikkor to the 39mm mount case! 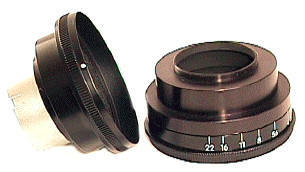 The over sized lens shade is the ultra rare diaphragm collar. On the left it's mounted as a regular sun shade -- not the best use, but it will work. 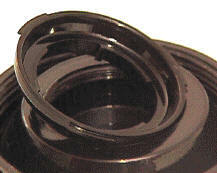 The diaphragm collar was designed for copy stand use, when the Micro lens aperture ring is inaccessible in collapsed position. 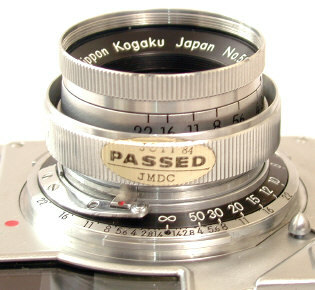 For copy stand use, the lens is first locked in collapsed position. 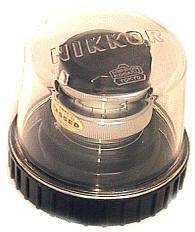 The diaphragm collar base slips over the edge of the Micro's chrome rim, lining up with the four spaces in the knurling, as shown above. After the base is mounted, you screw in the top portion, adjusting it so the f/stops on the collar correspond with the f/stops on the aperture ring. To see how this works on a copy stand, visit the PA Copy Stand profile. Micro collar courtesy of Bob Knowles. 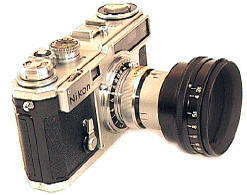 The original 1956 Micro Nikkor was made in two mounts, Nikon and Leica 39mm screw mount -- both rangefinder coupled. The Leica mount looks much different with its own black helical focusing mount and chrome collapsible barrel. Robert Rotoloni's "Nikon Rangefinder" book estimates 1500 Micro Nikkors produced in both mounts. I think about 300 were made Leica mount based upon my experience. Although the Leica mount is rarer, the Nikon mount usually sells for more due to much higher collector demand. 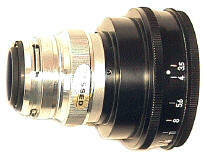 Interestingly, Rotoloni says the same optical formula was reused in the famous F mount Micro Nikkor in 1960. Strangely, the 50mm f/3.5 Nikkor Rangefinder Micro is MUCH rarer than production numbers would seem to indicate. About 3,300 total 50/1.1 Nikkors were made, about 1500 total 50mm f/3.5 Micro Rangefinder Nikkors. Yet, I've personally encountered about 10 50/1.1's for every Micro I've found. I suspect the majority of special purpose Micro Nikkors were sold to military and industrial buyers, and never survived their experience. Or, perhaps somewhere Nikon has a warehouse with about 1000 new Micro Nikkors. hmmm.